With natural disasters occurring practically every day – at least in some parts of the world, it is only common sense to do as much as you can in case you actually find yourself in the middle of an emergency – or even the aftermath. We have emergency kits, first aid kits, and all sorts of other kits that can help keep you alive. 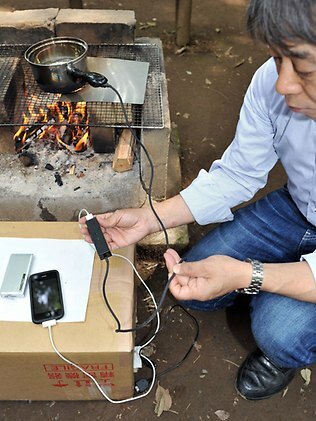 What Japanese company TES NewEnergy has done is to add to the arsenal of emergency supplies that everyone has to have. Think about it – after an earthquake, a typhoon, or a flood, electrical power may not be readily available. You might find yourself camping out in an area where there are no facilities. Even evacuation centers may not have a steady supply of electrical power. You probably will have some gadget that needs electricity – chances are that you will have your mobile phone; maybe you’ll have an mp3 player. While these things may be frivolous in times of a natural disaster, they can help survivors make their situation a tad better. Your cell phone can be used to call relatives and friends. It can be used to call for help. At the very least, if your situation is not that bad, it can be used to amuse yourself. The problem is if you’re out of juice. That’s where TES NewEnergy’s gadget comes into the picture. It is basically a cookpot which can be placed over a campfire. At the end of the pot’s handle comes out a wire which has a USB connector at the end. This connector can then be used to hook up a mobile phone or any other compatible gadget, allowing for the transfer of electric power. This is made possible by the temperature differential between the bottom of the pot (which can reach up to 550 degrees Celsius) and the boiling water that the pot contains (100 degrees Celsius). With this set up, it can take anywhere from three to five hours to fully charge an iPhone. At the same time, you can make lunch or heat it up! The use of the pot is not limited to emergency situations. The gadget can also be used in places where electricity is not yet available. When you go camping, you can also lug this pot around – it is small enough to carry around. The gadget is already available in Japan for $284.55, and the company is planning on marketing it in other parts of the world soon.